After having disappeared for twelve weeks, activist Zhao Haitong (赵海通) of Xinjiang has resurfaced, with his family learning that he was formally arrested on September 12 on suspicion of “inciting subversion of state power.” Currently held at Urumqi City Liudaowan Detention Center, Zhao went missing in mid-August in the process of helping local Uyghurs to lodge their grievances. In recent years, Zhao has been active in Guangdong Province with various advocacy efforts, including participating in protests against Internet censorship and official corruption. 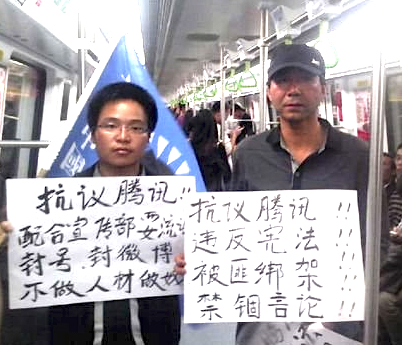 Zhao Haitong (赵海通, right) with fellow activist Huang Wenxun (黄文勋) protesting against Internet censorship in early 2013. Xinjiang authorities detained Tang Xueqin (唐学勤) and Xing Zhaojun (邢肇均) in a “black jail” to prevent them from traveling to Beijing ahead of the Chinese Communist Party’s Third Plenum, which is to be held November 9-12. Both were among a group of nine individuals forcibly taken back to Xinjiang on October 19 from Majialou, a temporary detention facility in Beijing. During the four days en route to Xinjiang, petitioners were subjected to beatings and deprived of food. Upon arriving in Xinjiang, Tang and Xing were each given a seven-day administrative detention for “abnormal petitioning.” After the detentions were completed, stability maintenance officials from their workplace took Tang and Xing away and detained them in a dark room in an office building. Since November 2, their families have not been able to contact them. In Beijing, a previously unknown “black jail” came to light recently. A hotel in the name of Jiruigong Hotel (吉瑞公宾馆), run by Jilin Provincial Public Security, is a facility used for detaining petitioners from Jilin until officials from their local jurisdictions come to take them back to the province. Local officials use state-allocated “stability maintenance fees” to pay Jilin Public Security for abducting and detaining the petitioners. Petitioners who had been detained there said police subjected them to beating and other forms of mistreatment. One elder female petitioner reportedly was beaten to death at this facility. The hotel is located at 8 Chengbei Road, Wanping, Fengtai District, Beijing (北京市丰台区宛平城北边城北路8号). Xinjiang petitioner He Cunying (何存英) was subjected to cruel and degrading treatment at a Re-education Through Labor (RTL) camp in 2010 and at a detention center in 2013 in retaliation for lodging grievances. 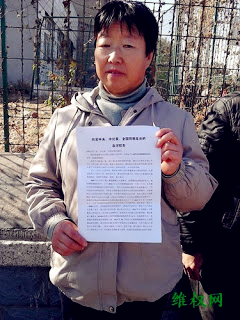 Since 2009, the 47-year-old He has been petitioning in Beijing about land that she had lost. Authorities from Xinjiang in 2010 went to Beijing and abducted her, and then forcibly sent her back to Xinjiang, where she was sentenced to RTL for fifteen months for “disrupting order of a public place.” During her detention at the RTL, police stripped her naked in front of other detainees as a way to try to humiliate her. After her release, He Cunying resumed her petitioning in Beijing. In July 2013, authorities again abducted her, sent her back to Xinjiang, and punished her with a 10-day administrative detention, during which guards stripped her naked and paraded her in view of others at the detention facility. He Cunying (何存英) was stripped naked in retaliation for her petitioning activities. CHRD has updated its online Partial Data on Deprivation of Liberty and Torture/Other Mistreatment of human rights defenders in China. The data includes individual cases that CHRD started documenting in January 1, 2012. Compiling information through October 11, 2013, the data include records on approximately 800 new cases since March 1, including individuals seized in the ongoing crackdown against peaceful assembly and free expression. The data is based on reports by human rights organizations working within China. The entire list of data, which is maintained on a regular basis, has information on more than 900 individuals, over 450 of whom have been subjected to threats, beating, forced confession, exposure, and/or other forms of torture. “Xinjiang Activist Zhao Haitong Is Arrested For “Inciting Subversion of State Power” (新疆维权人士赵海通被以涉嫌煽动颠覆逮捕), November 4, 2013, CRLW. “Jiruigong Hotel: Black Jail Operated by Jilin Public Security in Beijing to Detain Petitioners,” (吉瑞公宾馆：吉林公安厅设在北京关押访民的黑监狱), November 7, 2013, WQW. “He Cunying of Xinjiang Production and Construction Corps Stripped Naked in Retaliation for Petitioning” (新疆生产建设兵团何存英因上访被裸体示众), October 30, 2013, WQW.